A rare experience to learn backcountry medicine in a truly remote and international setting. 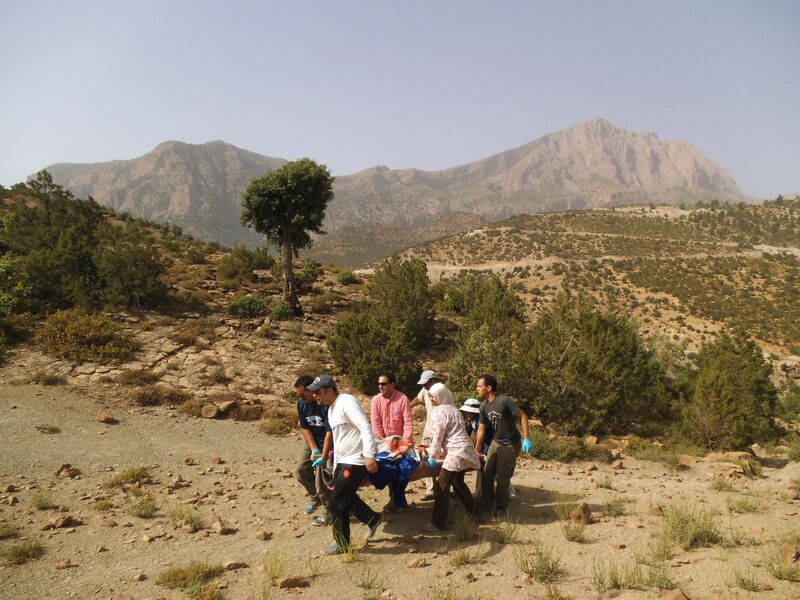 Aerie Backcountry Medicine is offering a Wilderness First Responder course in Zawiya Ahansal, Morocco from June 14 – 29, 2014. Anyone interested in pursuing work in remote, international settings should have this certification. This is a great opportunity to get your WFR certification while in the field. Aerie’s 72 hour Wilderness First Responder (WFR) course is designed for outdoor professionals and outdoor enthusiasts, preparing them to care for injuries and illness in remote, challenging environments. The course is fast-paced, challenging, hands-on and fun. Wilderness First Responder (WFR) courses can be taken for 2 Montana University System credits (additional fee applies). This program is in participation with the Atlas Cultural Foundation and Association Amezray SMNID. Zawiya Ahansal is a remote and mountainous region located between 5,000 and 12,000 feet in Morocco’s Central High Atlas Mountains. It is a high desert region with temperature extremes in June and July ranging between 32 and 110 F. Regional equivalents are the City of Rocks in Idaho and southern Utah. Students should be prepared and comfortable with working and studying in all weather, including rain, wind, and heat. They should be physically fit and able to hike in mountainous terrain. In addition, all students will need to be physically able to work, study and hike at 6000 feet above sea level for an extended time. Students will be living with the sheikh of Zawiya Ahansal and his family and should therefore be comfortable with and respectful of Muslim culture. Meals are prepared by your host family and are traditional Berber Moroccan cuisine. Sleeping rooms will be shared amongst students and are gender separated. Three days of the training will be spent on an overnight camping excursion into the high grazing grounds of Morocco’s largest nomadic tribe, the Ait Atta. Participants will see centuries’ old remote living at its most basic and see the nomads on their annual migration from the Sahara Desert into the High Atlas Mountains in search of water for their camels, goats and sheep. The Ait Atta live a life without medical care in some of the harshest conditions in North Africa. The rest of the training will take place in the village of Amezray at the the headquarters of Association Amezray SMNID. Participants will spend one day of the program working with the Atlas Cultural Foundation and the local association Amezray SMNID on a community service project. Live with the sheikh, tribal leader, of Zawiya Ahansal and his family. See the Ait Atta nomads on their annual migration to high pasture. In depth lessons on snakes and scorpions. Visit the weekly market in the village of Aguddim. Students interested in learning about backcountry, expeditionary, and travel medicine. Outdoor professionals or enthusiasts who want to travel or work in remote and dynamic environments. Students looking to gain experience in patient care in the developing world, where medical care is limited. Explorers looking to discover vibrant and culturally rich Morocco. Students enrolled in MSU’s Morocco Sustainable Community Development Program: $1225, including books and materials. Hotel in Marrakesh on arrival and departure (2 nights total). 11 nights, 10 days. Includes breakfast, lunch, and dinner, shared sleeping rooms (gender separated), and shared shower and bathroom facilities, and treated drinking water. Includes breakfast, lunch, and dinner, two-person tents (gender separated) and treated drinking water. The course is for English speakers, there will not be a translator. 2 Montana University Credits are available to participants. Financial aid can be used for the course. 8 days of class time. 1 community service day with the Atlas Cultural Foundation and the Association Amezray SMNID.